Yisrael Kristal sitting in his home in Haifa. Israel. Kristal is a Holocaust survivor and the world's oldest man, according to Guinness World Records. 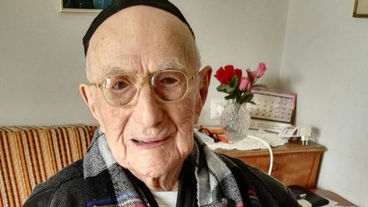 He celebrated his long-delayed bar mitzvah this week at the age of 113. Splendid and shared over social media. Thanking you kindly Cal for sharing this story❤️. Mazel tov Yisroel Kristal! Not as old but my father had his bar mitzvah when he was 80 or 85-i can't remember which. So heartwarming. I'm glad he was able to finally celebrate. Good on him! Congratulations!!! It's never too late . . . . . . . . . .